Summary: Two years ago, sixteen-year-old Jamie Henry breathed a sigh of relief when a judge sentenced his older sister to juvenile detention for burning down their neighbor’s fancy horse barn. The whole town did. Because Crazy Cate Henry used to be a nice girl. Until she did a lot of bad things. Like drinking. And stealing. And lying. Like playing weird mind games in the woods with other children. Like making sure she always got her way. Or else. Review: Often times when I figure out the twist in a book I usually stop reading because the result of the twist is often predictable. With Complicit the opposite happened. I figured out the twist maybe about 3/4 of the way, but was so involved in the mystery of how, and what would Jaime do with the information once he realized it, that I kept reading – well past my bedtime in fact and when I finished the book, I was lost for words. Seriously. Kuehn ends this book hitting you right in the gut and you take it because she has you travel this road with Jaime while he searches for answers, you end up really caring for Jaime, wanting happiness and peace for him, and then Wham! She throws that ending and you’re left dumbfounded. And then you do a slow clap for Ms. Keuhn because you realize you have just experienced a master storyteller at work. I’ve heard a number of criticism about YA not being “literate” enough or deep enough or just full of romance and angst (ugh, whatever!) and I wish to throw Complicit at them as the example of what smart writing for young adults looks like. Kuehn’s writing is crisp, her dialogue realistic, and moves at a pace that doesn’t let up from the first word until the last. Weaved within the present story is the moments before Jamie’s sister went to jail, focusing on their relationship. These moments do not slow the pace of the story, instead they drive the mystery that Jaime is attempting to solve (and also, if one is astute, foreshadow the plot twist). Kuehn’s writing doesn’t talk down to the young adult reader, rather she treats her readers with respect and presents the subject matter of mental illness as one would with an adult novel. I must applaud Kuehn on how she presented mental illness as a real, daily struggle for Jaime rather than use it as a gimmick for shock value. So let’s talk about Jaime, shall we? He’s an unreliable narrator if I ever saw one, but you connect with him, feel for him because you know that he’s had a troubled past that he doesn’t remember much about but desperately wants to know. Jaime is adopted and is struggling, like many adoptees go through at a certain point, to want to know more about his birth mother. His only link to her is his sister, but she and he have a troubled relationship. They clearly love each other, but Cate acts horribly to Jaime sometimes and he doesn’t understand why. With his confusion about his mother and his sister, one can really empathize with Jaime. However, there are hidden clues sprinkled throughout that makes the reader, if they are paying attention, not really believe what Jaime is saying. There are periods of his life, in the present narrative, that Jaime doesn’t remember. How can a reader trust the narrator when the narrator doesn’t even know what he’s doing sometimes? And that is the beauty of Complicit, in that even though Jaime is unreliable, he still is relate-able. We care, deeply, for the one who is living the lie. Kuehn has written him so well, so earnestly, that I didn’t care that Jaime’s narration was unreliable until the very end. Actually, I felt sorry for him at the end because…well, I think you just have to read the book and then you’ll understand my feelings. I haven’t read Charm & Strange, but based on what I experience with reading Complicit, I’ll be running to my library to check it out. 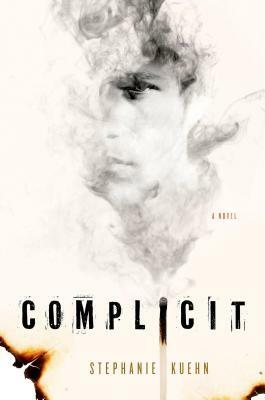 I’ll also be eagerly awaiting anything else Ms. Kuehn writes because the thrilling ride she sent me on with Complicit, I can’t wait to go on again.